…and every real voyage deserves a good cup of tea. Tea is one of the few things that is commonly found in all corners of the world, from Yerba Mate in Argentina to English Breakfast in England, from Darjeeling in India to simple yet invigorating green teas in China. In Turkey everyone comes together over tiny shot-sized cups of sweet apple tea or a pure black tea, from ice cream vendors to restauranteurs to shop keepers, uniting locals and tourists alike. Discovering a new teahouse or shop is, for me, a goldmine when traveling. I’ve rarely found a tea shop that I haven’t enjoyed, but some certainly stand out more than others. Here’s a list of my top six tea spots around the world, plus a bonus destination at the end! 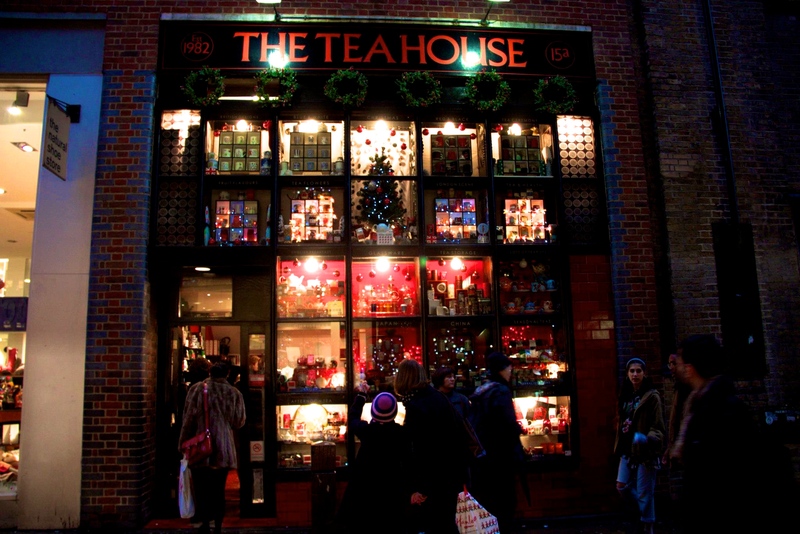 The Covent Garden Tea House is located on Neal Street right in the heart of Covent Garden, a minutes’ walk from the Covent Garden tube stop. The shopfront is a myriad display of teapots arranged in cubic rows on a backdrop of white and bright red, broken up by a lattice of painted black wooden window frames. Inside, the shop is quaint and full of aromatic goodies, with teas and tea-steeping paraphernalia located on the first floor, tea tins lining the front wall of the staircase and an extensive collection of teapots and mugs flanking the stairs, leading up to an attic that, unsurprisingly, is packed to the brim with more teapots. The teas on the first floor are arranged by type, with greens typically at the front and blacks typically at the back. The store boasts an impressive collection of herbal infusions as well, including flaky nettles and tiny, beautiful dried rose hips. Unfortunately, teas here can’t be sampled, but they do have small portions available for the customer to sniff before making their ultimate decision. My personal favorite teas from the Covent Garden Tea House include the Green Chai Sencha, Gunpowder Mint Green Tea, Caramel Black Tea, Vanilla Black Tea and the seasonal Christmas Tea. I also almost always buy at least one small packet of the flowering tea balls located at the checkout counter. 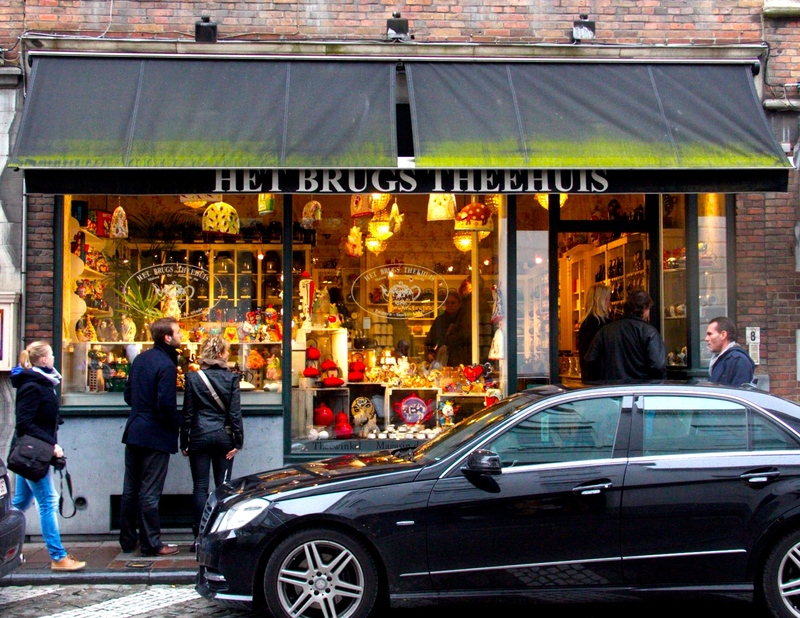 Another distribution-only tea shop, Het Brugges Teehuis is a small, two-room shop that boasts large tins of unique, flavorful teas. In the back room you can find any manner of tea paraphernalia, from tea towels to teapots, teacups, tea cozies, teaspoons and the like. They have a number of unique designs and an extensive collection of animal-themed pots and cups. The owner is very friendly and helpful, too! One of my favorite teas ever, a green tea flavored with chunks of real Belgian chocolate, comes exclusively from Het Brugges Teahuis and is highly recommended. One of my favorite tea distributors and tearooms, Argo Tea, originated in my home city of Chicago, Illinois. Since then, it’s expanded to include locations in many cities across the United States, including Boston, New York, North Carolina and Washington DC. Modern, chic and stylish, Argo Tea not only delivers a consistently high-quality product, but also offers a comfortable and attractive sitting room where you can sip your tea and read the newspaper, work on your computer or chat quietly with a friend or colleague. In addition to serving teas, they also sell teas both in bulk and in small quantities. Their pre-packaged teas come in cute containers and make for great gifts for any tea-loving friends on your Christmas list! Their teapots are also to die for, offering bright colored traditional-styled pots (which include a removable mesh strainer for all your loose-leaf needs) as well as sleek glass pots, including their new Mono Teapots. My favorite flavors from Argo Tea include a blueberry white tea, a white peach tea and an Armenian mint tea. The Boulder Dushanbe Teahouse looks like a work of art from the inside out, decorated intricately with tile work, hailing from as far as Tajikistan. The ceiling is painted and carved, and the entire atmosphere is reminiscent of a sultan’s palace. 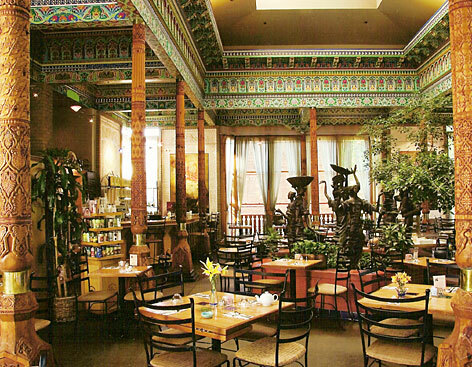 The Boulder Teahouse is not only a beautiful, atmospheric tea room, but also serves tasty meals and high tea. They also offer teas for sale, all of which you can sample with a meal, over dessert or simply on their own. Some of my favorite teas include the Boulder Breakfast and the Huckleberry Lime tea. A small-scale chain teahouse, Dobra won my heart for being a relaxing, if a little bit hippie-esque, place to have a nice cup of tea and some really, really tasty food. They have gluten free and vegan food items that from appetizers to desserts. 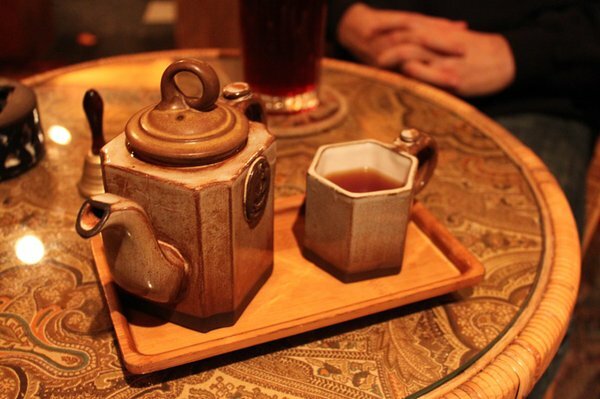 Their teas are out of this world, and are served in teapots or cups that reflect the traditional consumption methods from the tea’s country or region of origin. Seating is varied; there’s a handful of tiny tables, but most people choose to sit in the private-ish sections, which boast larger tables that sit only a foot or so off the ground. Pillows and bean bags are the primary places for sitting, and its easy to lose whole afternoons here. My #1 favorite and most highly recommended tea here is their Masala Chai, which is served with milk and honey. Their hummus plates are also fantastic! Originally an Austrian operation, Demmers Teahaus now functions as a chain that stretches throughout Eastern Europe. The location I visited was in Budapest, on the way from the Parliament Building to the City Center. They had an impressive tea menu, which made it really difficult to choose just one! I had an green tea flavored with orange, which I would highly recommend, and my mom had a basic breakfast tea, which she liked very much as well. 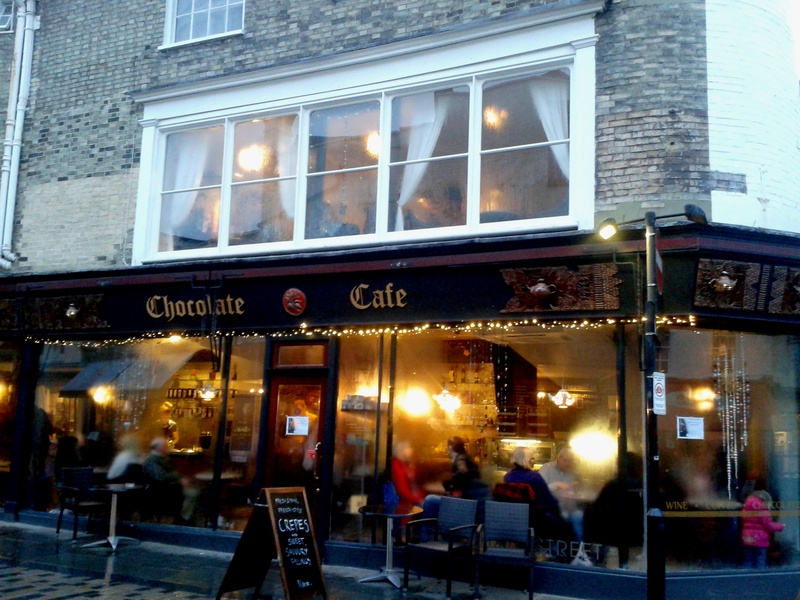 I know it isn’t exactly tea, but if I’m giving shout-outs for my favorite beverage destinations, I cannot ignore the Chocolate Cafe in Canterbury, Kent (UK). Their hot chocolate is thick, rich and creamy, but not suffocatingly sweet or too dense. There are great views of the Canterbury Cathedral upstairs, and quaint views of the medieval streets from the ground floor. This is my absolute favorite destination in the entire city of Canterbury, so make sure you don’t miss it on your next trip! 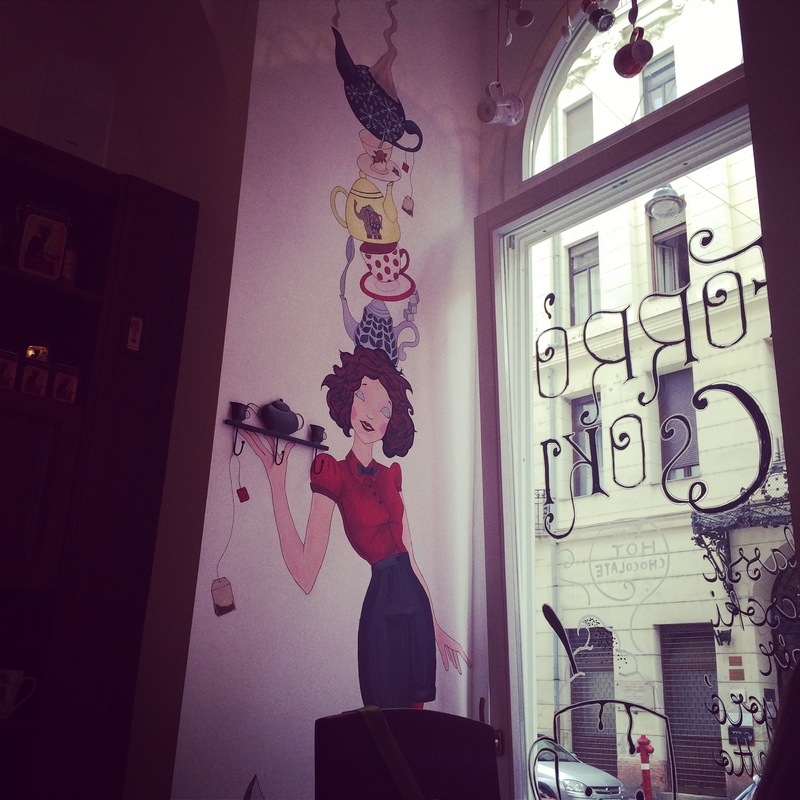 Do you have a personal favorite tea spot that I haven’t mentioned here? Let us know in the comments!